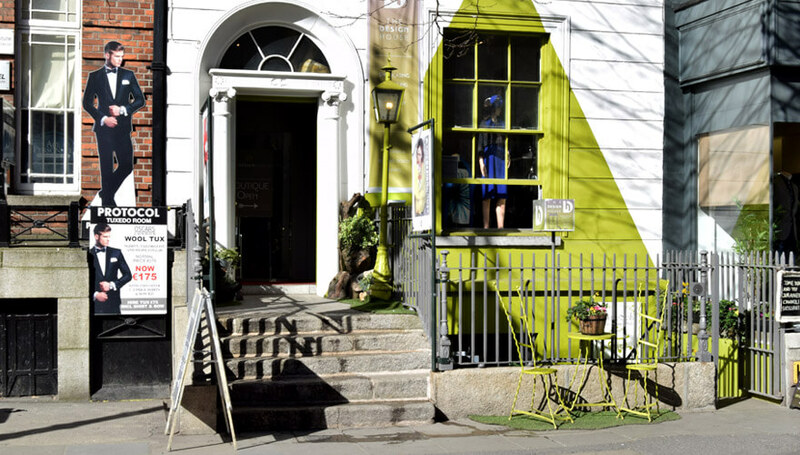 Half way down Dawson Street, nestled away in an old Georgian building, is the Design House – a thriving hub of creativity. The Design House was founded by Irish fashion designer, Bebhinn Flood. 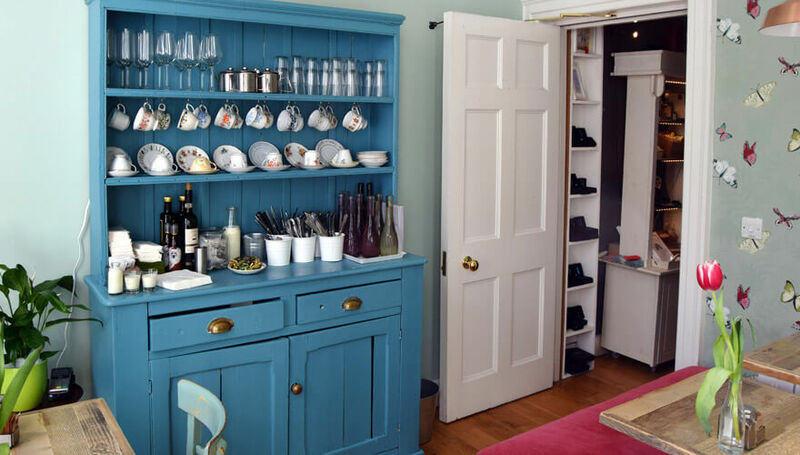 It’s the creative home to several in-house designers. With design and retail under the one roof, it’s like buying straight from the studios. The hallways host a gallery of art. Over 60 designers, mostly Irish, sell their creations here. Cutting-edge fashion, jewellery, bridal, vintage and a variety of crafts all in the one beautiful Georgian building. Not to mention the authentic Italian café in the basement, which has just expanded upstairs. This retail experience has it all, bringing creative authenticity to Dublin’s Dawson Street. Dublin.ie: Where did the idea to set up the Design House come from? Bebhinn: I was managing the Loft in Powerscourt Townhouse for 7 or 8 years. I had two rails. People kept asking me ‘oh, can I get another version of this made?’, or wanting to get things altered. I was driving back and forth from my studio in Greystones every day, sometimes twice. It was just crazy. I needed machines and retail all in the same place. I noticed there was two niches in the market. The designers needed somewhere where they could sell from, and somewhere they could work from. So that’s why we have the studios upstairs, and retail downstairs. I don’t think there was anywhere else in Dublin like this, not when I first set up anyway. Dublin.ie: What kind of design is produced here? Bebhinn: We have a mix of everything, fashion, millinery, arts, crafts, jewellery. We probably have over 60 designers – the majority of whom are Irish. The leathers are from Italy, and some Italian jewellery. We’re more than happy to take designers that are not Irish. We have over 14 artists here too. A lot of the stuff that is sold here, is made here, but a lot of the designers have their own studios too. Working in the building we have a media company, scarf designer, milliners, tailors, event managers, swimwear designers…the list goes on. Dublin.ie: Was it a scary decision to take the leap and open The Design House? Bebhinn: Every day, I say ‘Jesus, did I bite off more than I can chew?’. I had just had a baby. The day I signed the lease on this building, I gave birth to my son. It definitely was a lot to take on. I had received a grant, and it had to be used by a certain time. Within that time, I found out I was pregnant. It’s a beautiful building. It’s all upwards, so it’s hard to move stuff around. There is a lot of machinery upstairs – that took a lot of manpower to move! I always wanted a building like Galeries Lafayette in Paris. I wanted it to have food areas throughout the building, so you could take a break, shop before and after. Dublin.ie: It’s a great resource here in Dublin, is there a market for Irish design? Bebhinn: We have a good mix of consumers. Some really good, loyal people come in and support us. We don’t force the whole ‘made in Ireland thing’, but the majority are made on the premises. Tourists love to hear that, but sometimes if you force the whole ‘made in Ireland thing’ people can be a bit ‘ah whatever’. Dublin.ie: You work from a studio upstairs, and sell here too? Bebhinn: I’m a fashion designer – occasion, bridal, a bit of everything. I do consultations here too. Yesterday, I did a bridal consultation. I designed like three different dresses for the bride. People love to be able to get exactly what they are looking for. Women will come in and explain what they want and I squiggle what they are saying, and start creating dresses. Sometimes they want to cover their arms up or have a high neckline. It’s great that they can get exactly what they want. Dublin.ie: What do you think of the fashion scene in Dublin? Bebhinn: It’s there. It doesn’t get enough backing for it to be bigger. In fairness, Dublin Town & Dublin City Council do as much as they can for the Dublin Fashion Festival. Someone needs to get behind the younger designers, the up-and-coming, to help them a bit. There is amazing talent in Ireland, and it gets a little lost sometimes, unfortunately. It’s one of the reasons we are doing this and trying to help them. We also do workshops here. We have courses where people can learn how to make a skirt, a dress, a blouse. It is aimed at beginners. We do cool, little afternoon tea ones. They are three hours long. You can make a headpiece or jewellery, and get some cakes and wine from the café. Have a few creative glasses of wine, and make a masterpiece! They’re brilliant for hen parties and gatherings. Dublin.ie: Do you like being based in Dublin? Bebhinn: You’re in the hub of it all. Dawson Street is a really nice location. We look out at St. Anne’s Church and the Mansion House. Back in the 18th century, this street was full of watchmakers, tailors and fabric houses. That building across the road was actually a whore house. Would you believe, it’s actually one of the best-kept Georgian buildings in Dublin. In our building there was a dressmaker. We had a tour in a while ago, and a woman said ‘I came up these steps before, I bought my wedding dress in this house’. Now we’re making wedding dresses in here too. It’s nice, I feel like we are keeping the history alive in some ways.